Recorded about a million miles ago, this collection from the nation’s foremost musical road warrior shows no signs of wear and tear. Long-time fans of Geremia will recognize his reverent yet distinctive interpretations of old blues classics, peppered with exquisite originals, like the melodic lovers’ Morning Song. Each track, whether cover, inventive arrangement of a traditional number or purely Paul, stands shoulder-to-shoulder with the Masters. New listeners will encounter the most talented student of traditional acoustic music, a careful and sincere singer/songwriter who makes his teachers proud. Guitar & harmonica--Paul Geremia; Mandolin--Rocky Rockwood; Trombone--Rip Bang. The bottom line: Geremia, through the better part of a lifetime on the road, has assimilated the old-time country blues that he loves into a unique personal style, driven by his instrumental virtuosity and attention to detail. Paul abandoned all other forms of support and has been surviving by music alone since 1966. This man is the ultimate touring machine; he has seven albums to his own credit and has appeared on two anthologies, as well as sitting in on numerous other recordings with various artists. He has performed in almost every manner possible, from street musician to exclusive clubs and concerts bookings. His performances have not been limited to the U.S., either. Paul has travelled extensively throughout Europe, Canada, and England, and is well known. Paul is a versatile musician, playing acoustic guitar (both six- and twelve-string), harmonica, and the piano, as well as doing his own vocals. His music is whatever he decides it will be: smooth and very intricate, or hard-edged and really rough. It all depends on how Paul wants to interpret his material. And he has a very large repertoire to chose from, with the material including old-time country blues, early jazz, his own compositions, and his own arrangements for traditional material. Paul has the gift of making every song he plays his own, no matter who has performed it before. 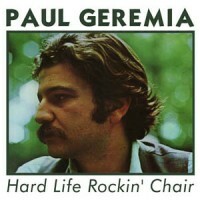 Hard Life Rockin' Chair was originally released in 1973 and is an excellent show piece of country blues. Its fourteen tracks cover a large amount of territory, and Paul has the chance to show his many skills. Whether a long time fancier of country-blues, or a new listener, there will be something on this disc to appeal to you." Morning Song," the opening track, is a nice mellow love song. Making up after a good fight usually brings a couple closer together, and this song captures that love completely. "The morning light can not realize all I've seen in your eyes..."
With "Don't Sell It, Don't Give It Away," Paul gets into a little pickin' and a lot of blues! Never go against your woman's wishes, it'll only give you a real serious case of the blues. Even if you can get another woman without much effort. The lonely wail of the harmonica opens up the traditional song "Come Back Baby." This is a natural follow-up for the previous song. "Come back baby/and let's talk over one more time..." It deals with heartbreak and is the soul of the blues. This was arranged by Paul as well, and it is most assuredly a track he puts his all into. I appreciate the blues every now and then, and this CD will most likely see a lot of playtime on those mellow Sunday afternoons in the warmer months. Odd how the blues seems to pick you up and make you feel better, when it really should depress you! Paul's distinctive voice manages to get across each and every nuance of feeling. If he is this good recorded, I'd like the chance to see him live!